Much like the hopes and dreams of the thousands of untalented singers who failed to win a single American Idol competition, both NBC and Fox’s plans to bring the hallowed singing competition series back from the grave have been crushed by Fremantle Media and Core Media Group. 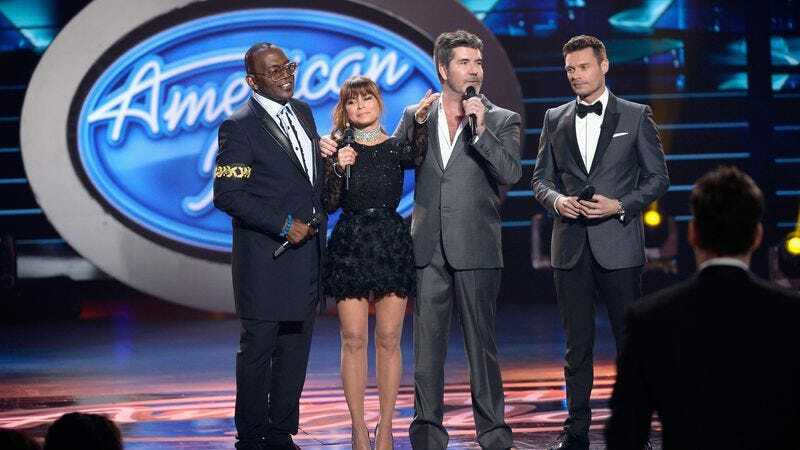 The two networks had been competing for a chance to bring American Idol back, with NBC hoping to make it a third reality competition pillar alongside America’s Got Talent and The Voice, while Fox was simply jealous that another network was interested in its old show. The problem with love triangles like that, though, is that sometimes neither of the two parties vying for the attention of the third get what they want. That’s exactly what’s happening here, as TMZ is reporting that Fremantle and Core—the production companies that own American Idol—have decided to drop all plans for a revival after they couldn’t agree which network to go with. Apparently, Fremantle was pulling for NBC since it also owns America’s Got Talent, but Core was concerned that putting both of those shows on the same network would “diminish the unique value” of American Idol. Fremantle and Core still can’t agree on which direction to take, so now nobody gets new episodes of American Idol. Naturally, there’s only one song that fits in a time like this.